In your first year of playing, you find yourself excited to show up to every practice. You are blown away by how good the veterans on the team are. Every day you’re learning a new skill or a new way to think about the game. Every week it seems that you are doing something new and everyone is excited to compliment you on your firsts. You throw your first in-game forehand. You hit the ground for the first time. You score your first goal. You get your first layout block. You’re excited for your second year because you know you have so much that you want to work on and improve. But when practices start, the milestones seem to stretch way further out. Your successes seem hard to replicate. Your forehand is consistent but now your backhand seems to have regressed. You are aware of all of the mistakes that you are making and how much you have still to learn. The rookies are improving so fast and you feel like you’re standing still. You start leaving practices frustrated and don’t always look forward to cleating up. The end of the year comes and your improvement over the course of the season seems small. You feel you’ve plateaued. You start your third year humbled by the sport. You cared so much last year and thought you were going to keep improving at the rate you’d improved your first year, but you fell short of your expectations. Far short. Then you step on the field to start the year and while everything seems to move slow, you move fast. You seem to be getting the disc a lot, anticipating the movement downfield, completing tougher throws, shutting down good cutters consistently. Everything is just clicking. You match-up against the rookies and 2nd year players and can exploit every weakness of theirs. Your playing time ramps up a bunch and you start to play some really important points or take a really tough match-up. And, while you fall short sometimes, you sometimes rise to the challenge and make a big play against a big opponent in a big moment. The younger players look up to you. Now you’re in your fourth year. You’re a leader on the team, maybe even a captain. It’s going to be your year. The team is looking to you to push them at practice and lead off the field and you know you’re going to be the best leader the team could hope for. You expect to execute everything perfectly in practice and dominate every opponent. But, at practice, you make mistakes in drills and feel like you’re letting your team down. Your focus on the team, planning practices, giving feedback, and thinking about what you’re going to say in a huddle, draws you away from your focus on your own improvement. You feel like you’re worse than last year. Your team loses an important game and you dwell on your own mistakes and how you let the team down. You’ve found yourself at another plateau. Maybe the timeline isn’t exactly right, but the challenge of the plateau is nearly universal for any player focused on improvement. For many, the expectation is that improvement is linear and directly relative to the work that you put in. Whether that’s true or not is beside the point. The problem is that even if improvement is linear, the perception of improvement is often far from it. That perception can lead to frustration and — if you respond poorly to it — the plateau can reinforce itself. As you gain greater awareness of the sport, you become more aware of what you want to achieve. This is important for goal setting and continued improvement but it can also come with increased expectations and awareness of where you’re falling short. You are using a different measuring stick for your abilities. Your growth and improvement feels far different when you measure yourself against your first day of practice than when you measure yourself against what you hope to achieve by the end of the season. It turns your focus towards your mistakes instead of your successes. While you aren’t making more mistakes, you become acutely aware of the mistakes you are making, what would have been better, and how those mistakes impact your team. These are all prerequisites to improvement but the list of weaknesses you are aware of feels vast while your pace of improvement seems slow. Remember that time you completed your first 20-yard forehand in flow? That was awesome. And you can throw that throw consistently in warm-ups and drills but you seem to struggle doing it consistently in games. That’s because there are many, many 20-yard forehands with subtle differences based on factors like the wind, the angle of the receiver’s cut, the mark’s positioning, the defender’s positioning, and more. Recognizing when the situation is right for which forehand takes far more practice than getting that first 20-yard forehand down. And because we overemphasize the accomplishment of completing that first forehand and underemphasize the difficulty and complexity of applying that forehand consistently, we perceive a plateau in improvement. It is tempting — particularly when you are in a competitive environment — to avoid your weaknesses as much as you can. Your 20-yard forehand is inconsistent so you are tempted to not risk it and just find the reset instead. Your defensive footwork isn’t adequate so you are tempted to just play looser and not challenge the cutter in small spaces. But that type of processing leads to extending your plateau, as your game becomes defined by your weaknesses. You are using a crutch for your game and so those weaknesses further atrophy. While on the plateau, the mistakes are plentiful – particularly if you aren’t hiding your weaknesses. And when you consistently leave practice with a focus on every mistake you made, you may find yourself in despair and miserable. That feeling leads to not wanting to play or not wanting to challenge yourself. That will extend your plateau and, worse, end with you no longer enjoying an activity that you fell in love with. Related to focusing on your mistakes is constantly comparing where you are to where you want to be. You expect to be a dependable contributor, a shut-down defender, or a first-option receiver but you aren’t there yet and every practice and game is a reminder that you aren’t there yet. If your expectation is your measuring stick, your best possible outcome is just being adequate, but 99% of the time you’ll disappoint yourself. Some players can handle that constant disappointment and find it motivating, but many I’ve coached become disheartened and extend the plateau. When you are on a plateau, it’s easy to find excuses for why you aren’t improving. This is particularly true if you’ve been acutely aware of your mistakes or you are measuring yourself against your expectations. While mostly an internal perception, the frustration of the daily grind on the plateau is easy to project outwardly: my team isn’t fun to be around, maybe I don’t like ultimate all that much. If you’re at that point, you are at the step prior to dropping out entirely and the plateau has almost won. Have goals instead of expectations. Goals are targets that you are striving for and include you as THE actor and one responsible (as opposed to an expectation in which your role is passive). Goals should be SMART. Specific: Your goal should be as explicit as possible. Goals that are broad are hard to work toward. If you have a broad goal, identify smaller, more specific goals that will lead to you achieving your broad goal. Measurable: A measurable goal is one that you can say for certain you’ve achieved or haven’t achieved. Goals that aren’t measurable allow for subjective interpretation – and, if you’re on a plateau, you’re likely to perceive yourself not achieving it. Measurable goals are critical for acknowledging growth while on your plateau. Achievable: Your goals should be around 80% achievable, meaning if you do the work, in most cases, you’ll get there. If they are 100% achievable, you may be setting your goals too low. If your goals are regularly too hard to achieve, you may feel a decline in motivation. If you need help with this, ask your more experienced teammates and coaches. Achievable goals are critical to breaking out of the perception of the plateau. Related to overall goals: Goals shouldn’t be set in isolation. Maybe you have a high level team goal — such as making Nationals — and you have a specific role in that goal. Or perhaps it’s a personal goal such as making a club team. Your SMART goals should be designed toward achieving that overall goal. If your team is looking to you be a lock-down handler defender, set your goals around that instead of that 50-yard forehand huck that three other guys on your D-line already have. Having goals that are related to higher level goals should mean that your growth will be met with external rewards, such as more playing time or making a team you are striving for. Time-Constrained: Your goal should have a set date by which you hope to achieve it so you can evaluate if you achieved it. This is pretty easy in ultimate. Maybe it’s by tryouts, or by a certain tournament, or by the end of the season. 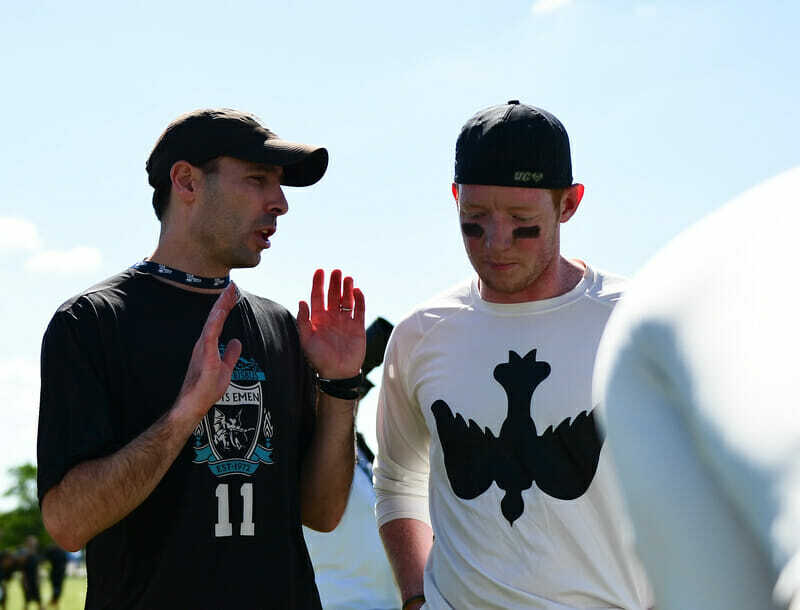 So, let’s say that you are working on improving your consistency and confidence in throwing yardage-gaining forehands so that you can be a bigger threat with the disc. A potential SMART goal could be: “At my next tournament, my goal is to throw no more than one turnover to open-side under cutters between 10 and 30 yards while completing at least 8 such throws.” This goal is specific (open-side forehands to under cutter between 10 and 30 yards), measurable (at least 8 completions and no more than one turnover), achievable (we’ll just assume that this is something that you can’t currently do, but with practice will be able to), related to overall goals (becoming a bigger threat with the disc) and time-constrained (for the next tournament). Once you’ve set your goals, take time to envision the challenges that you may face along the way. If your goal is to not allow more than two upline handler cuts against you per tournament, envision the best handler on your team attempting a specific move and how you’ll react to it. Imagine being beat by that handler at practice and how you’ll react to it. Research has shown that people who envision the challenges that they will face are more resilient in the face of those and other challenges, and are more likely to achieve their goals. There is a lot of material out there about having a growth mindset. I won’t repeat it all here, but it’s important to start with the understanding that you can improve and that your current state isn’t fixed. Having goals is important, but it’s also critical that you value your work, even when it’s not clear that you are moving toward your goal. Did you put yourself in difficult situations? Did you make mistakes within your framework of improvement? If so, you are growing. Take time to also measure yourself against your past. What gains have you made? Where have you improved? Even if you fall short of a goal, you may still find motivation in your work and improvement. If one of the challenges to plateaus is that applying skills consistently in a variety of situations is hard, much of the “work” you’ll need to do is putting yourself in a variety of situations and learning how the skill should be applied in each, then learning how to execute it. The only way to do that is to play a lot. It helps to play in different contexts, too; 3v3, goaltimate, summer leagues, and pick-up provide opportunities outside of your team setting to learn. Even disc golf, double disc court, and other disc games can provide valuable practice for improving your throws. Try also to play different roles and in different offensive and defensive sets; seeing the field from different angles provides you with additional information. Feel free to approach this play as exactly that: “play.” You don’t have to join summer league or goaltimate with the sole intention of trying to improve. Often, when you stop trying so hard to get better and just enjoy how good you are, then you remove some of the barriers to improvement that you may have placed on yourself. While it’s possible that playing a variety of roles, in a variety of systems, in a variety of contexts can lengthen a plateau, in most cases it will also greatly extend your next period of quick improvement. During the plateau, you are taking in vast amounts of new information; during your next period of growth, you are synthesizing it with the skills you have. The more information you collect during the plateau, the longer the period of growth. Mistakes are a critical part of improvement1. The challenge with pushing through the plateau is to not attach negative emotion to making mistakes that will push you to either be unhappy or lead to risk avoidance. But, you do need to be aware of mistakes. When you watch a video of other people playing, you see players make mistakes and succeed; you can learn from that without feeling an emotional attachment to it. Use that as a model for yourself. When you make a mistake during play, make a mental note of the mistake and save it for later. Once out of the heat of competition, replay the mistake but from the perspective of a third party watching. Similarly, you can practice non-judgemental awareness when you watch others play. If you see someone make a mistake and get beat, say to yourself “that’s a good learning moment for that player” instead of the judgemental “he must be embarrassed.” Those emotions that you are projecting on other players echo the ones that you are feeling yourself when you make mistakes. The two major risks of a plateau are (1) avoiding the discomfort of making the repeated mistakes necessary to move past the plateau, and (2) letting the repeated mistakes undermine your passion and motivation. To successfully address the plateau, you have to acclimate to being uncomfortable, to putting your weakness on display, and to risking mistakes. Measure your success at practice by how many times you made yourself uncomfortable. If you find success doing something, acknowledge that success and move on to the next challenge. For example, if you’re guarding a secondary cutter and are succeeding at your goal of “stopping her from catching the disc deep” up your goal to “stop her from catching it on the open side” or move on to a primary cutter and challenge yourself there. When repeated mistakes are taking you past a state of being uncomfortable and toward a state of despair, instead of dialing back to a comfortable place in terms of your on-field challenge, seek support and comfort off the field. Check-in with your teammates about ultimate or non-ultimate stuff. Tell a friend what you are working on at practice and ask them to provide some positive feedback on it. Or, if you’re failing to challenge yourself, ask them to challenge you. Having a meaningful, non-ultimate conversation can help too. It’s important to remember that if you’re like most ultimate players, you chose ultimate partly because it’s a team sport and you want to take on challenges together and you get satisfaction out of supporting others and being supported. Every player experiences plateaus in their growth as an ultimate player. Plateaus, of course, are not limited to our sport — or sports at all. Growth in any realm of life is not always linear. Moving through a plateau requires balancing taking risks and making mistakes with thoughtful internal and external support of that risk-taking. Coming next week in Part 2 of this column is advice on how coaches can help players move beyond their current plateau. In the meantime, for some fun additional reading on plateaus, check out this excerpt from David Foster Wallace’s Infinite Jest. Comments on "Surviving The Plateau"